Back in 2005, we noticed the rendering below by Forza Architecture taped to the window of a dirty grey building on the corner of 18th Street and Market Street on the border of the Russell and Portland neighborhoods. The single-story building is simple and austere with detailing reminiscent of 19th century industrial buildings in Louisville, one of the best types for converting to modern use. 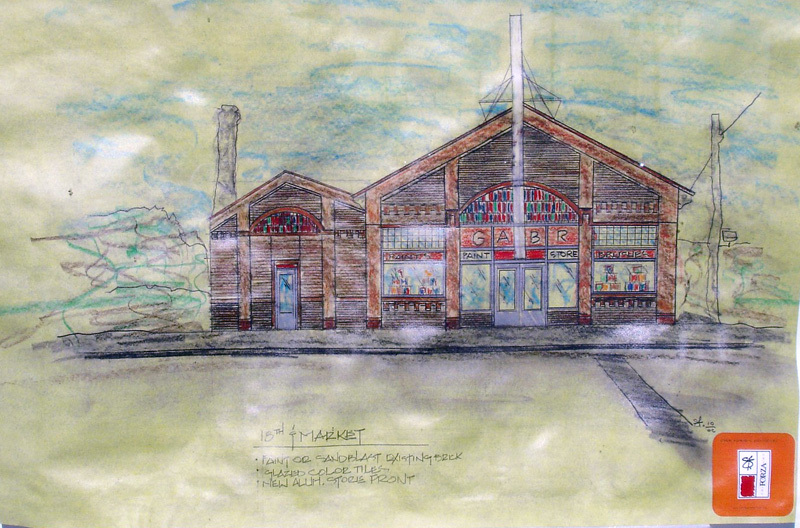 The rendering described a proposed renovation to the building that included painting or sandblasting the historic brick structure, applying decorative colored tiles above the door, and building a new storefront that respected the symmetric nature of the building. We caught back up with the building, and it appears that only one of the first of three points—paint—was applied. And what a color scheme with bright red, purple, and orange. The colors by themselves brighten up the intersection and give the building a playful nature, perfect for use as a daycare that a for-lease sign claims the building is ready for. What’s strange, however, is the riverbed stone veneer applied to the engaged columns of the building. They don’t feel reminiscent of an urban building and tend to distract from the colorful scheme and texture of the century old brick. Colorful tiles might have been a better investment. Overall, its great to see this building shaped up (despite a broken window on the side-street). It can be difficult to generate much excitement with such a small project, but with the use of color, this small building has provided its neighborhood a great positive. 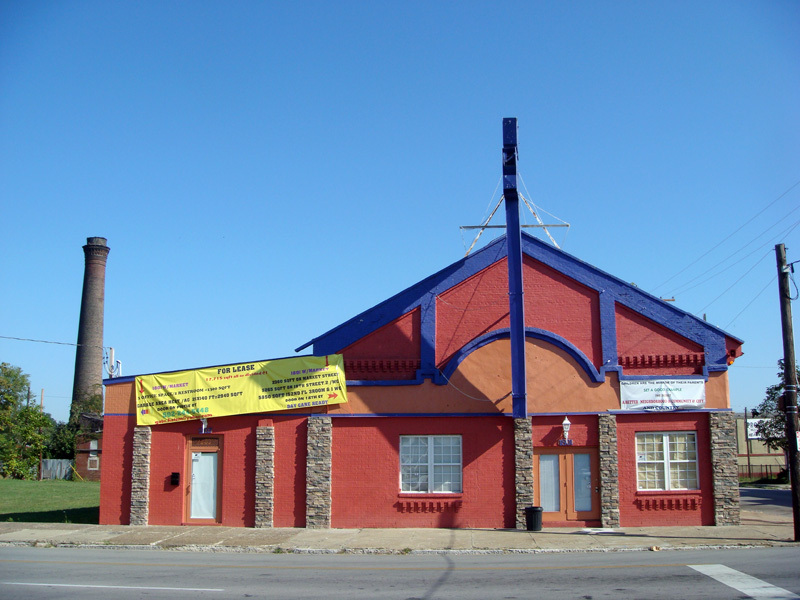 The location is also adjacent to the renovation of the Ouerbacker House two blocks east, the Cedar Street residential development, and the African American Heritage Center to the south. Perhaps a new town center for Russell can be coaxed to emerge in the surrounding area.